What mad genius first combined raspberry with coconut? Oh, no, no, no. When did this happen? 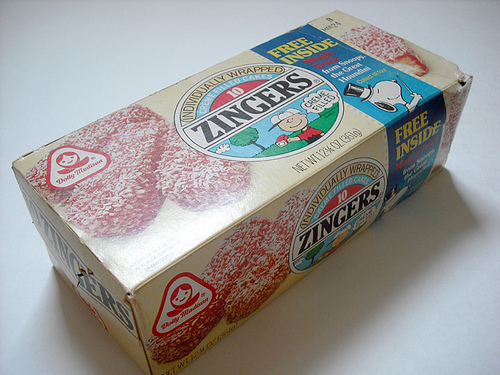 Everybody knows Zingers are made by the fine folks at Dolly Madison. I'm not hallucinating this time, I swear! ﻿ It's...it's true. Hostess and Dolly Madison, bitter rivals for snack cake supremacy when I was a child, are now owned by the same parent company, Hostess Brands, Inc. The company also owns Drake's Cakes, made famous in the "Seinfeld" episode "The Suicide." Raise your hand if you watch "A Charlie Brown Christmas" every year and still expect the announcer to say, "...brought to you by Dolly Madison." BelSpouse and I say it out loud every December when it airs, and Precocious Daughter thinks we're nuts. BelSpouse, by the way, doesn't much care for Zingers, especially raspberry coconut ones. Claims he's allergic to coconut or something. I love him anyway, because when you're married to have to adjust to your partner's bizarre character flaws. So I've heard. This whole Hostess Zingers thing may take a while to adjust to, as well. But I'll get used to it. Even if I have to eat my way through an entire box to do it.